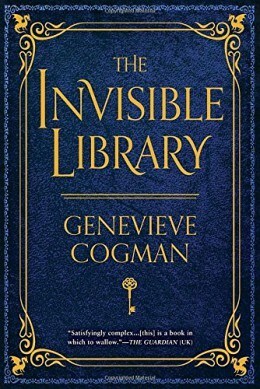 The Invisible Library by Genevieve Cogman grabbed me with its name and cover design before I even knew what it was about. Yes, I’m that much of a book nerd. But, as I began to read the synopsis about a mysterious entity called The Library that employs individuals to travel through space and time and acquire books for preservation, I was drawn in further. Being a Librarian for The Library is more than just acquisitions; sometimes they actually have to use nefarious means to secure the book they are tasked to retrieve. There is this grey area of the Library being the ‘good guys’, preserving significant works, where really they are stealing them from these different worlds and alternate realities of well-known cities. The Invisible Library begins with Irene, who has already been a Librarian for a number of years and has some existing backstory. I actually like when books start sort of in media res with a character. Following Irene from the outset would probably be dull, but knowing she has made some enemies and isn’t exactly clean herself makes it more intriguing. When she gets saddled with newbie Kai, it’s an interesting development and I do enjoy their dynamic, although it was a bit predictable (mysterious newbie with frequent mention of dragons…hmmm). I appreciated that there wasn’t an overt romance, although there were hints at romance subplot that might be explored in future books. I enjoyed the light nature of the story—it was clear who you were rooting for, and the pace of the story moved along quickly. It wasn’t overly predictable, and the twists were believable. Not deep in character development or heavy in philosophical undertones, but it was just what I needed; a solidly written adventure with interesting characters and a unique setting. I liked the world-building aspect of chaos-infested worlds, some with high technology like cyborgs, and how Cogman dealt with alternate cities and the grounding of The Library. I was very satisfied reading The Invisible Library and would definitely continue reading the series.